As our highest ranking female police officer and our most senior female member of the public service, Donna Adams has a unique story to tell. Advancement was not on her mind when she joined Tasmania Police after college. But her skills as an investigator, leader and innovator have seen her achieve the rank of Assistant Commissioner and the state service role of Deputy Secretary – both higher levels than any woman before her. As she has risen through the ranks, Donna has been a mentor and supporter of both sworn and unsworn women in Tasmania Police, encouraging them to seek out opportunities for professional development, promotion and to demonstrate leadership. Most recently she was instrumental in bringing together women from across police and other agencies for the first Be Bold for Change forum. From her earliest days on the beat, doing the best job she possibly could was always top of her agenda. “Although I didn’t know it at the time, I had crafted a reputation for having an enquiring mind,” she said of her early days walking the beat in Hobart. “I knew everyone in the Hobart CBD: I knew their names, I knew where they worked and I knew all the street kids, as they were called then. I had their names and dates of birth and information about them all in my notebook. “Because of my reputation, one day CIB came to me about a suspect in an armed robbery who had a distinctive tattoo and I was able to steer them in the right direction. “I identified the right person and they were able to arrest him and get some of the money back,” she said. It was following that success that she was seconded to Glenorchy CIB and was then able to apply for a job at Bellerive CIB. “I’ve always had a commitment to learning and improving and being the best I can in the role I’m in. “My advice to female Constables today is that they need three things. Committing to always learn new things shows they are adaptable, flexible and can develop a broader understanding of themselves and the community they serve. By being operationally credible they need to be good at their jobs and “then a path will appear before them”. Knowing the business of policing means that they need to understand every aspect of the unit they’re in. “Every work area I go to I try to learn everything about it. That’s what influences operational credibility because you are able to give good advice,” she said. It’s certainly a philosophy that has worked for her. In 2014 Donna was awarded the Tasmanian Telstra Businesswoman of the Year for her work which saw Tasmania Police become the first police organisation to roll out mobile devices to the frontline. She has also been awarded a Commissioner’s Commendation for her work after the 1996 Port Arthur massacre, an Australian Police Medal for Distinguished Service and was acknowledged by the Australasian Council of Women in Policing as an outstanding investigator. 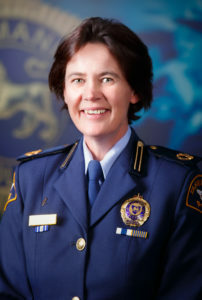 In 2011 she was promoted to the rank of Assistant Commissioner, becoming the highest ranked woman in Tasmania Police’s then 114-year history. In 2015 she was promoted to the role of Deputy Secretary of the Department of Police, Fire and Emergency Management. The newly created role saw her leave her rank behind and take leave from policing. This page -- https://www.police.tas.gov.au/about-us/100-years-women-policing-tasmania-police/profiles/donna-adams/ -- was last published on December 7, 2017 by the Department of Police, Fire and Emergency Management.